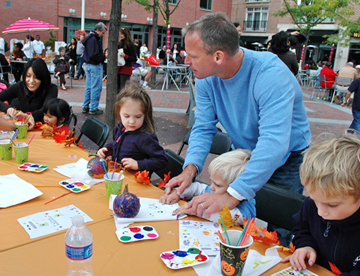 PAINTING PUMPKINS ON THE PLAZA: With Lee Beck supervising, the painters are Emma Reeves (left), Jake Beck (middle), and Will Beck (right), the occasion being Witherspoon Grills Harvest and Music Festival on Hinds Plaza. Proceeds from Sundays event went to the Trenton Area Soup Kitchen. Im doing as well as can be expected, said suspended Princeton Township Chief of Police Mark Emann in a phone interview on Tuesday. The Regional Planning Board meeting last week was packed by those with strong opinions about transit and transportation options in town. The overflow crowd had gathered to hear presentations proposing alternatives to the Dinky, the vehicle operating along the one-track rail line that connects Princeton to Princeton Junction, as well as statements advocating the preservation or augmentation of it. Borough Council unanimously passed three resolutions at last weeks meeting dealing with revaluation. Council member Roger Martindell had proposed versions of the resolutions in a previous session. The Princeton Regional Schools will come under particularly close scrutiny in the coming months as a result of both self-evaluation and participation in the tri-annual Quality Single Accountability Continuum (QSAC) state-monitoring process. Taylor Blair is savoring every moment she spends on the field this fall for the Princeton High field hockey team. Sharon Bloodgood, sales manager of The Residences At Palmer Square, is proud of her association with this new community. The elegant townhome and condominium community, which extends around Chambers Street, Paul Robeson Place, Hulfish and Witherspoon Streets, is now taking reservations. Stasse & Company in Pennington is the broker of record, and Minno & Wasko Architects & Planners were the designers.